Lysates of cell line HEK293. 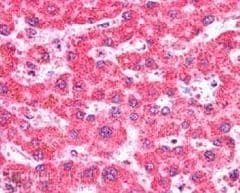 Human liver tissue. Rat cortical neurons. Our Abpromise guarantee covers the use of ab38789 in the following tested applications. WB Use a concentration of 0.3 - 1 µg/ml. Detects a band of approximately 75 kDa (predicted molecular weight: 69 kDa). The observed molecular weight corresponds to earlier findings in literature (Momeni et al, BMC Neurol. 2006 Dec 13;6:44.; PMID: 17166276). 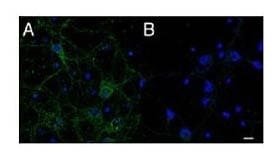 Anti-CMG1 antibody (ab38789) at 0.3 µg/ml + 293 lysate (RIPA buffer, 35µg total protein per lane). ab38789 at 5ug/ml staining CMG1 in human liver tissue section by Immunohistochemistry (Formalin/PFA fixed paraffin-embedded sections). Tissue underwent antigen retrieval in steam with citrate buffer (pH 6.0). The AP-staining procedure was used for detection. ab38789 at 2.5mg/ml staining CMG1 in primary rat cortical neurons by Immunocytochemistry/ Immunofluorecence. The image shows localization of CMG1 in cell body vesicles, along the neuronal processes. Image B is the control. Publishing research using ab38789? Please let us know so that we can cite the reference in this datasheet. There are currently no Customer reviews or Questions for ab38789.